On April 28th, NFFC and Iowa CCI staff joined ROC United, National Domestic Workers Alliance, the National People’s Action, and the National Organization for Women to show Congress that we are fed up with them favoring corporations over people. The march timed to coincide with the National Restaurant Association’s annual lobby day. “The other NRA” has worked to block minimum minimum wage increases, paid sick day legislation, and kept the federal tipped minimum wage at $2.13 since 1991. The NRA also lobbied against sustainable farming practices, farm animal welfare rules, and efforts to label the nutritional quality of foods in restaurants. We attended to show solidarity throughout the food system. Like restaurant workers, independent family farmers face enormous pressure and fear of retaliation from industrialized corporate agriculture. Like restaurant workers, farmers and farmworkers have seen zero pay increases and negative paychecks for their work. We are all working against consolidated and corporate industrial power. Furthermore, it is clear we need fair, living wages and workplace health and safety protections throughout the food system from the field, to the store, to the restaurant. “The Food ALEC,” the unified lobbying front of Big Ag and Big Food, has deep pockets and enormous influence in Congress. We need to mobilize across the country to demand a living wage for all workers. Check out this video taken while at the protest. We were able to peaceably take over several intersections in front of the Justice Department building and the Capital Grille, a restaurant with close ties to the NRA. We chanted “This is what Democracy Looks Like” and “One Fair Page” during the march and at each intersection. We often replied “That Ain’t Fair” in response to testimonials shared from workers and allies present. All in all, our energy was high and everyone seemed fired up to be marching. 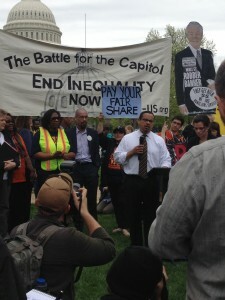 Representative Keith Ellision (D-MN) spoke at the closing rally stating that the Progressive Caucus was behind us but we need to turn up the heat on Congress and strengthen our mobilizations across the country for fair wages, fair tax code and to get corporate cash out of Congress. The NYTimes ran a full page ad Monday announcing the “Stop the Other NRA” campaign and petition. Op-eds are running in The Huffington Post, Mother Jones, and news outlets across the country. The Food Chain Workers Alliance is looking for farmer voices and collaborators to issue a joint statement over this next month. For more information about the campaign, check out ROC’s page here. To sign the petition calling Congress to stop taking corporate cash from the NRA, visit Stop the Other NRA. This entry was posted in Blog and tagged Congress, Consolidation, Fair Prices, Fair Wages, Food Justice, Food Sovereignty, Solidarity, USDOJ. Bookmark the permalink.